Hand wrought twisted wire pearl enhancer in 14 karat white gold. Sculpted one of a kind Gold ring. Heavy wires to contrast soft fabric like sculpted plates. A variety of gemstones decorate this gold slide. 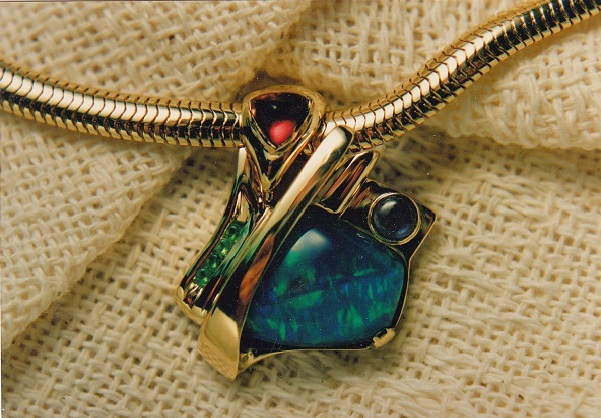 Featured as the major gem is an Opal accented to one side by a row of Emeralds, and on the other side a Sapphire cabochon, and above it a Tourmaline. Nugget Wedding set. 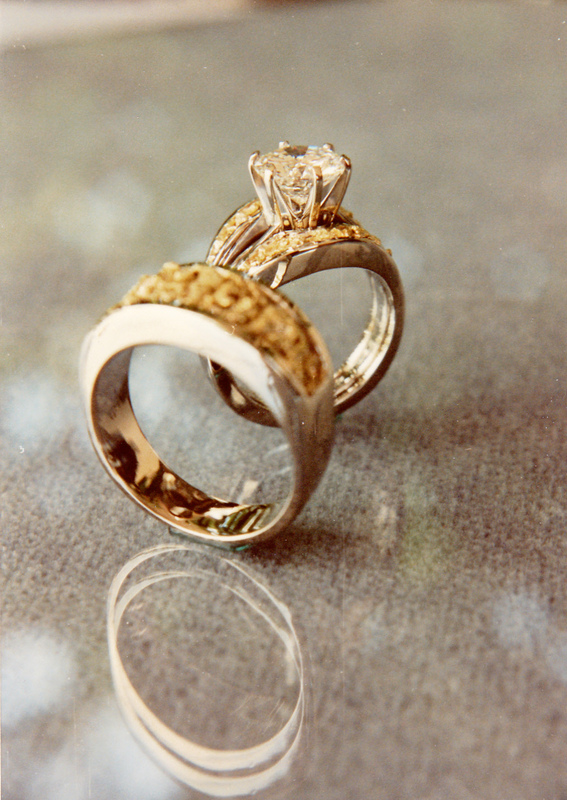 A Matching wedding set of gold nuggets. The Ladies solitaire Engagement band sits, with a 1.0 carat Diamond, in jackets of gold nuggets. The matching Gents band is a wide band filled with gold nuggets. 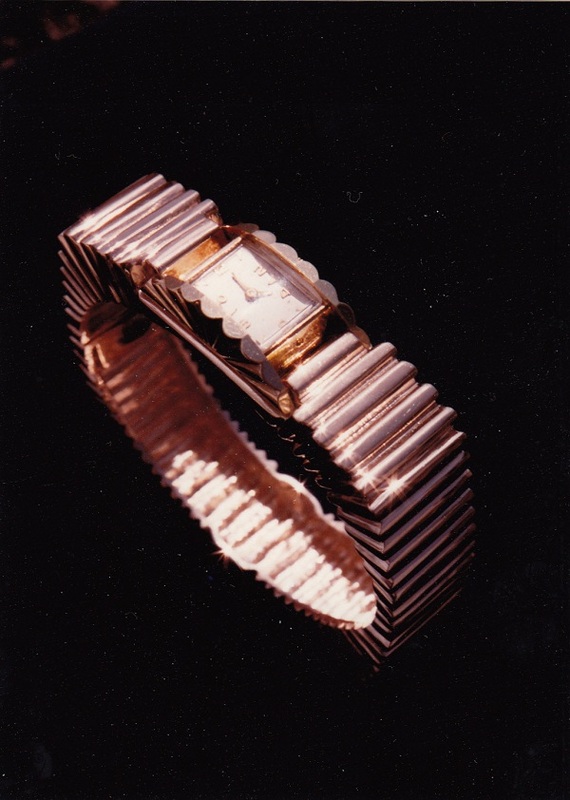 Hinged gold watch band hand carved wax and cast in 14kt gold. Fancy cut Sapphires set in a specially designed gold ring setting. 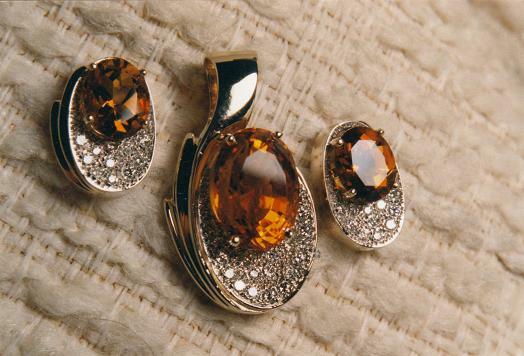 Matching pieces of Amber set in 14 karat gold earring settings. 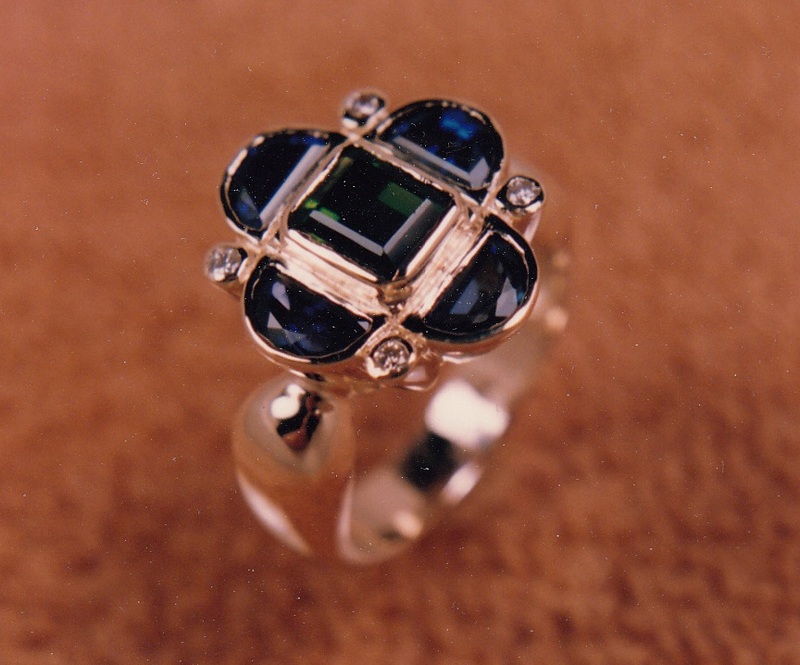 Gold ring with platinum accents topped with a bezel set large round Sapphire. 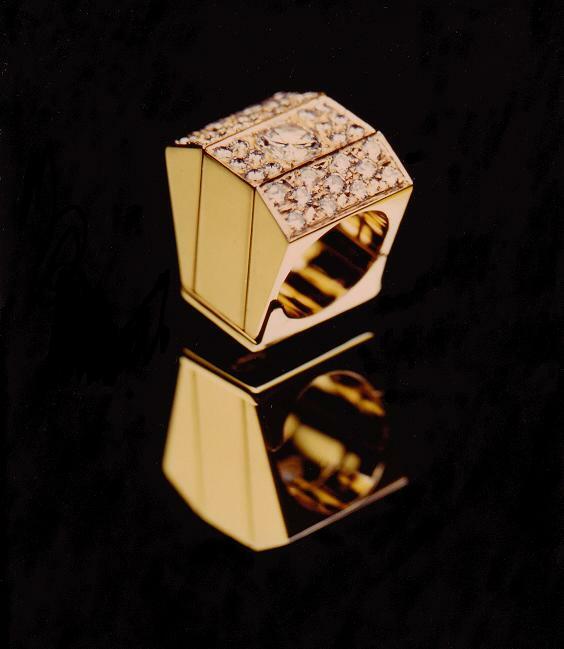 Solid ring weighs over one troy ounce in gold. 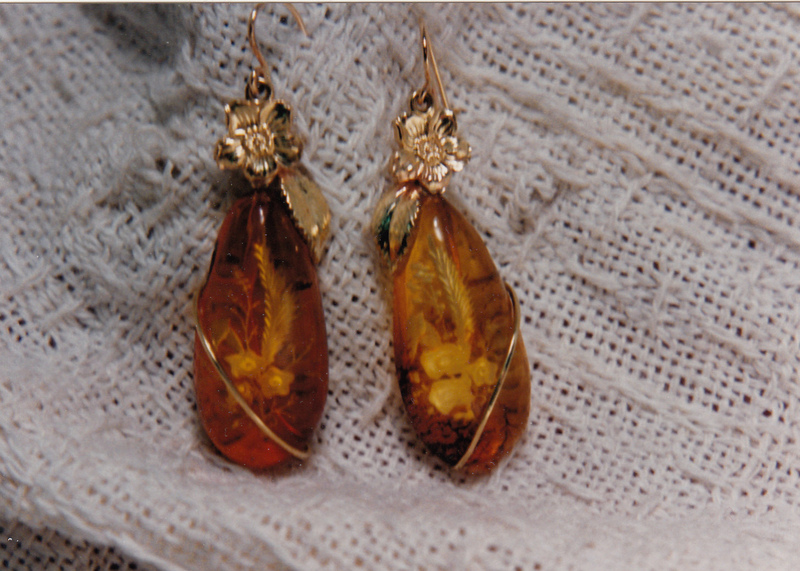 Gold Pendant with matching Earrings set with Citrine Gemstones. 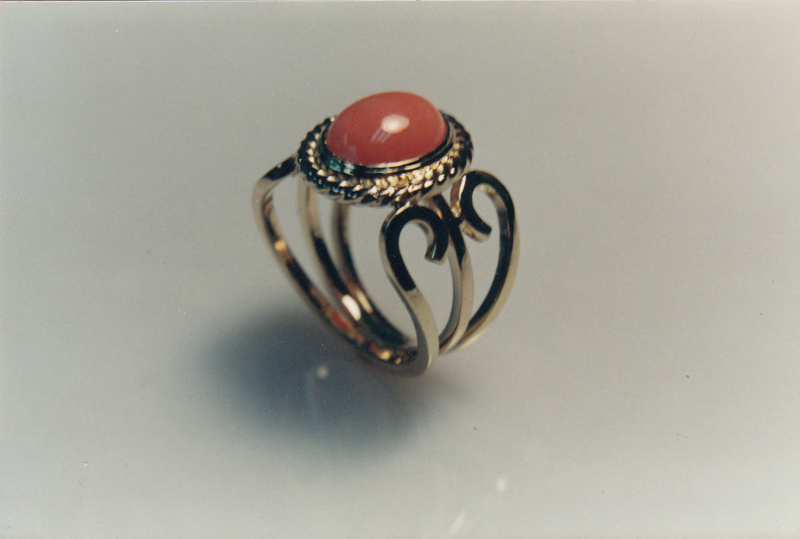 Exquisite all hand wrought wire work Ring with a bezel set Coral Cab. 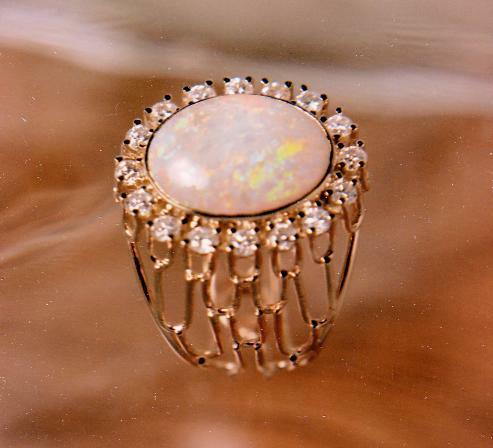 Diamonds around an Opal gemstone bezel set in gold handcrafted wire ring. 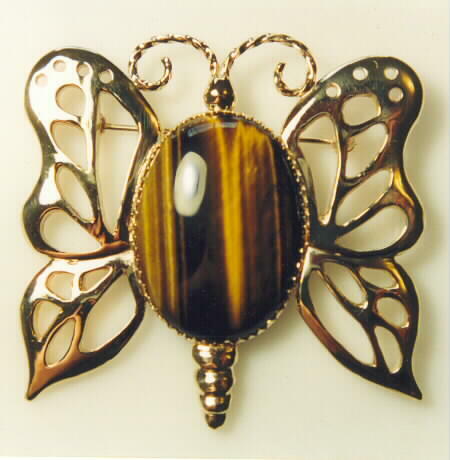 Tiger Eye Cabochon mounted in a 14 karat gold butterfly pin. The wings and the body were hand carved in wax then cast in gold. The antennae were fabricated from square wire. A white Gold spider set with a Sapphire in its body on a white Gold spider web dripping with bezel set Sapphires. 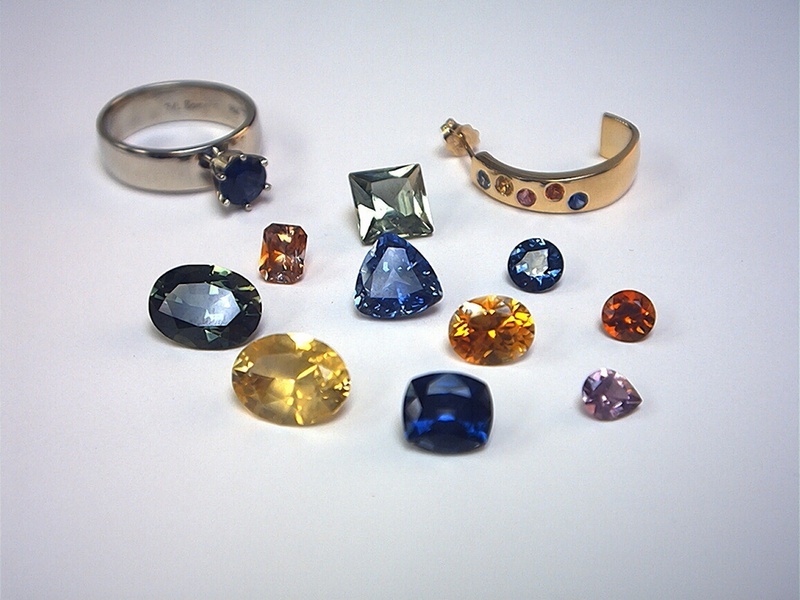 The Gemstones pictured above are all Sapphire. Sapphire comes in a variety of colors with the corn flower blue color the most recognized Sapphire gemstone. Pure corundum is called clear or white Sapphire. Corundum, which is Aluminum Oxide, is colorless. It's the integration of another element, like Iron or Vanadium, or the combinations of elements that creates a color. Ruby is red because of the inclusion of the element Chromium into the Aluminum Oxide crystal lattice. Man made Ruby was created back in the 1880's. 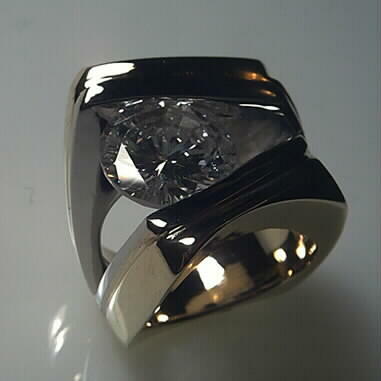 Three piece Diamond ring set designed by John Biazo and executed by Mark Somers. 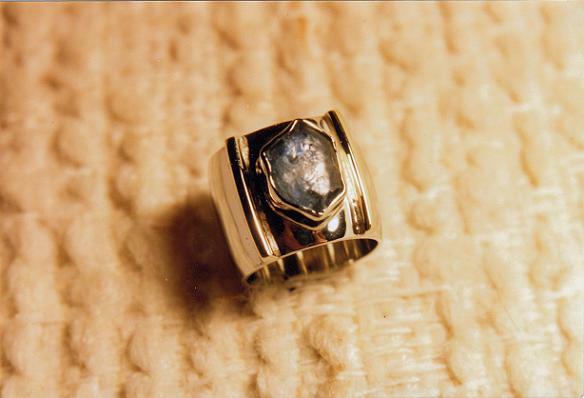 A gold liner was fashioned to hold the three rings in place while being worn. Other liners were designed to hold one and two rings at a time. 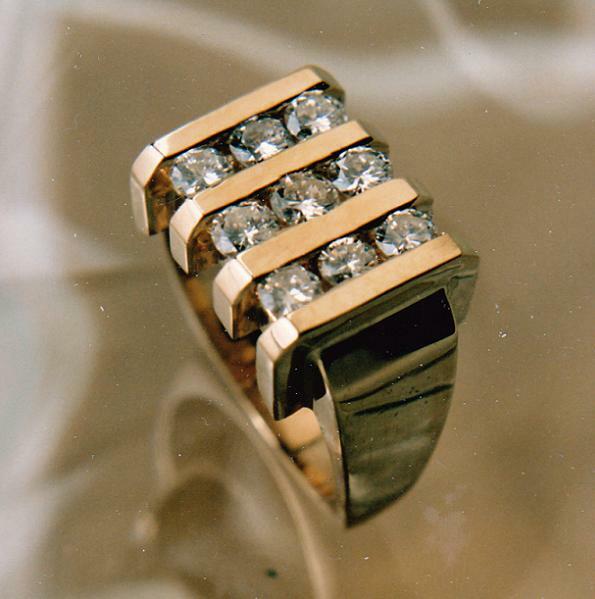 Channel set Diamonds in a Heavy gold ring. Story ring wax. A story ring is a ring with carvings depicting an event in life or it can be about a relationship. 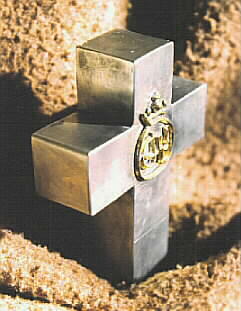 Salvador Dali designed the cross. The crosses were created in John Biazo's studio. Mark Somers under commission from John Biazo carved Dali's signature in wax then cast it in gold then soldered it to the sterling silver cross's. 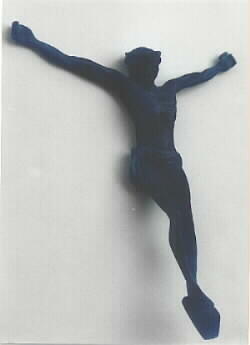 Wax carving of Christ. The wax was cast in 18 karat yellow gold then soldered to a hand fabricated gold cross. 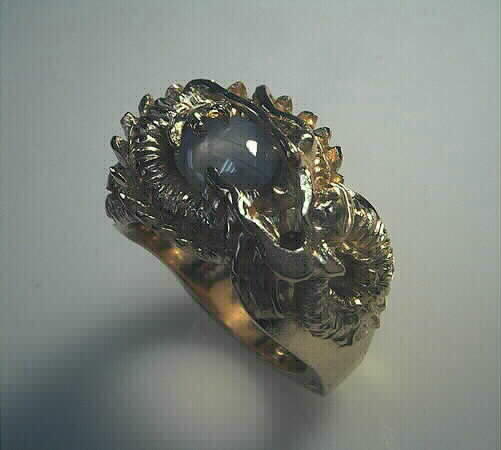 Gold Dragon Ring, designed, carved and executed by Mark Somers. 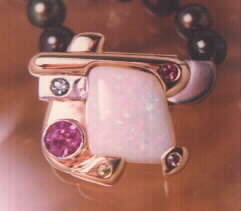 The Star Sapphire cabochon takes the place of where a pearl is positioned, according to custom. The dragon is of Eastern design, a serpent. 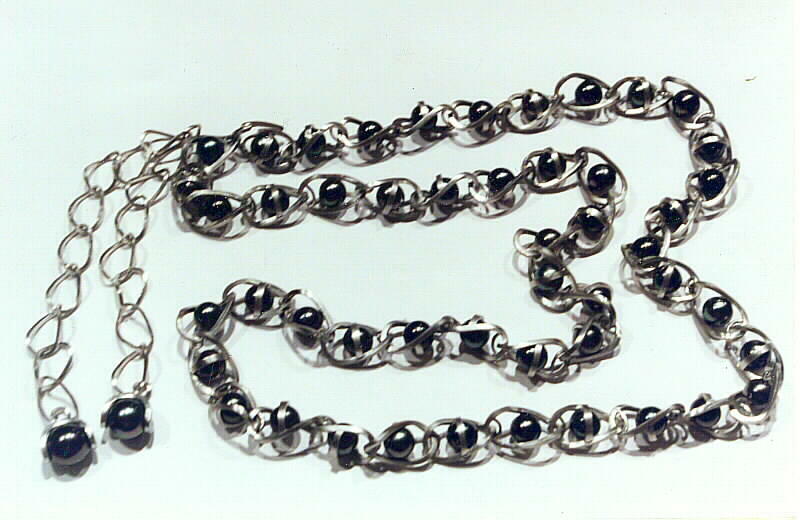 Platinum waist chain with Tahitian Black Pearls. The above waist chain weighs six and a half troy ounces. 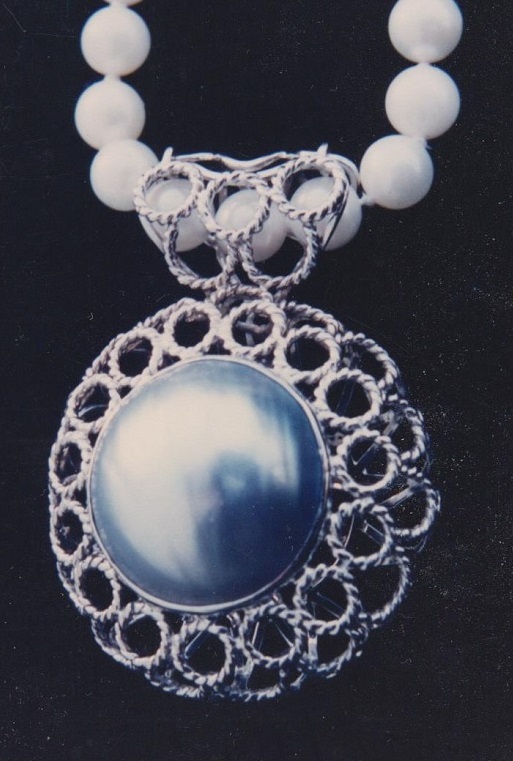 The fifty pearls set in the individual links are eight millimeters in diameter, the two sash pearls are eleven millimeters in diameter. The links were hand wrought from Platinum. 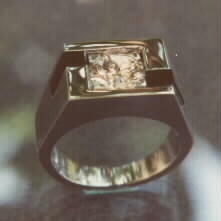 Gents Platinum ring with Black Jade accents on the top and side. In the center, a round cut diamond set low in a box like impression to look like a square cut diamond. Free form Garnet cabochon in a wire wrought gold ring. 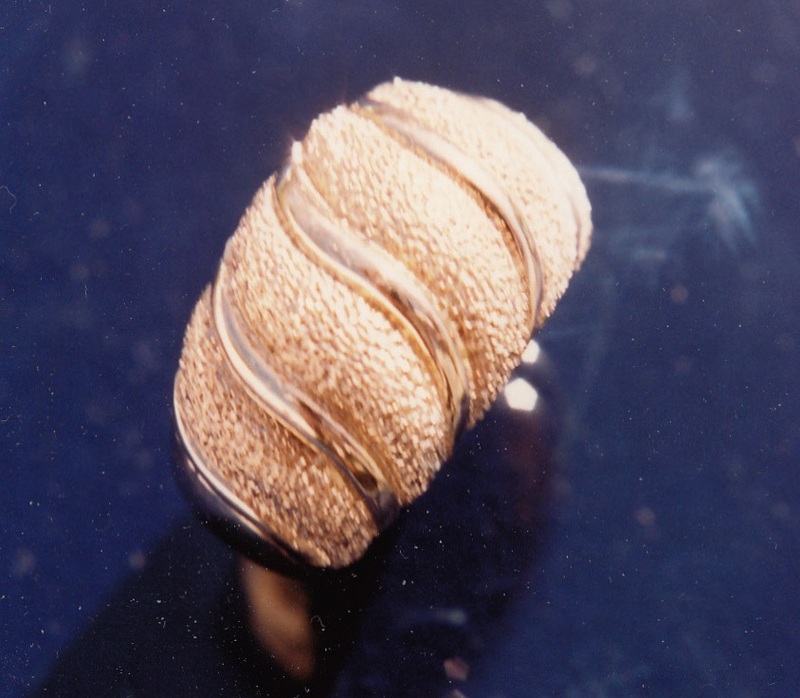 Twisted gold wire rings each one hand wrought and soldered to form a mesh like pillow of gold. 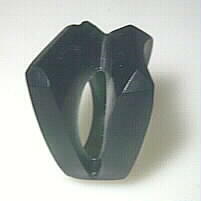 Wax carving two tone gents ring for Four and a half carat Diamond. 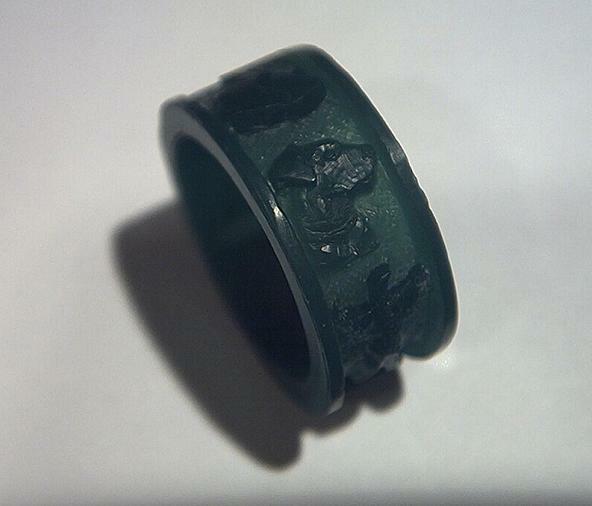 Finished ring of above wax carving. 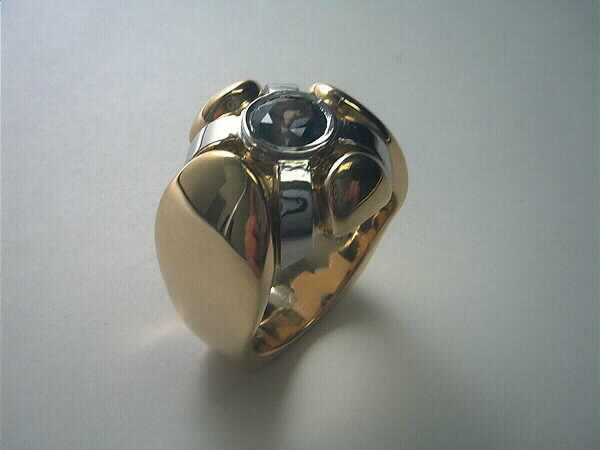 The two tone Ring has a 14 karat yellow Gold outside half with 14 karat white Gold for the inside half. White gold or Platinum is often used to mount Diamonds because the white metal doesn't impart any yellow color to the Diamond. Sapphire also looks better mounted directly in white metals. Ruby looks incredible in high karat yellow gold. 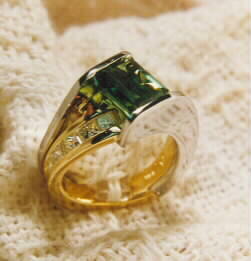 Emerald with Princess cut Diamonds in Platinum and 18 karat yellow gold ring. Citrine and Amethyst matching wedding set designed and created by Mark Somers. Exotic tear drop shaped Pearl enhancer accented with bright cut bead set Diamonds and bezel set diamonds. 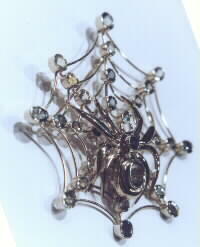 Gold Pearl enhancer adorned in tourmaline crystals designed by Lynn Booras and executed by Mark Somers. Pearl enhancer. 14 karat yellow and white gold around a white opal gem. This stunning design created by Lynn Booras. Very wide 14 karat yellow gold band with a Rough ( Unfaceted ) Sapphire crystal set in a bezel. 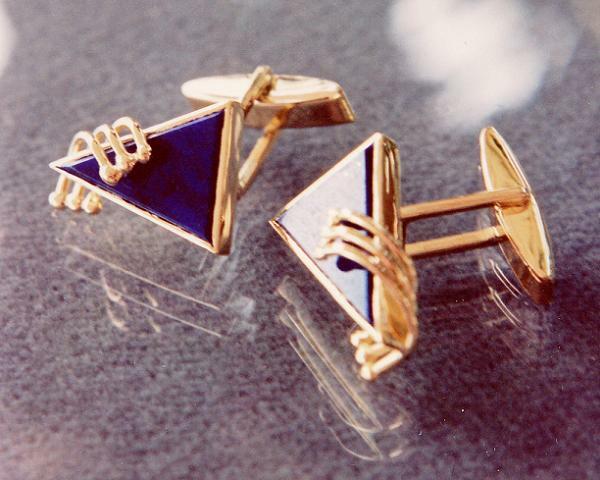 Lapis set in matching 14kt yellow gold cuff links.